Everyone who has done yoga tells everyone else that they should do yoga. It’s a great idea, since the goal is to help you stretch out and really take a breather, but twisting around like a Slinky is hard for a lot of people. If you use bad form or don’t understand how to breathe with your movements it can seem far more overwhelming than it actually is. 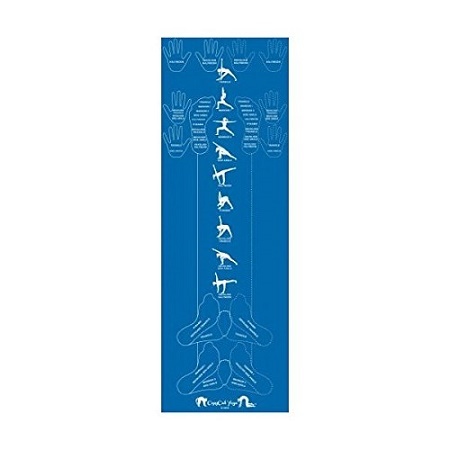 If you want to get into it, but don’t want to walk into a class without knowing a little bit on your own first, you can either watch YouTube videos, or get this CopyCat Yoga Mat. This mat is for beginners, and will show you where to put your hands and feet, giving you pictures of what your form should look like. It’s very long, and a bit thicker than most yoga mats to provide that much-needed extra squishiness so your joints won’t be as strained when you’re holding a pose for longer than ten seconds. There is free access to instructional videos with modifications for each pose on the mat, so before long you’ll be doing the more complicated stuff too. This is going to cost you $56, which is very costly when compared to a $14 yoga mat from a regular store, but the built-in instructor is where the extra money comes in. Quite honestly, finding a good YouTube series and mimicking the teachers form in front of a mirror is your best bet, but it’s all about being comfortable. Even if that means parting with a good hunk of change to stay that way.